A supermini mainstay, the Fiesta pretty much defines the sector alongside its Opel Corsa and Volkswagen Polo rivals. A supermini mainstay, the Fiesta pretty much defines the sector alongside its Opel Corsa and Volkswagen Polo rivals. This iteration, introduced in 2002, is the sixth in the series, it running through to 2009. Both three- and five-door models were offered, with a wide range of engines and transmission choices. Look on any street and you'll spot a Ford Fiesta such is their popularity, and with good reason; the Fiesta was not just practical and inexpensive, but fun to drive too. There's a huge range of engine choices, this generation of Fiesta being the first to be offered with a choice of diesel engines. That ground-breaking diesel offering was initially a 1.4-litre TDCi unit - shared with Peugeot's 206 and Citroen's C3 - though the diesel offering swelled to include a 1.6-litre TDCi unit later in the Fiesta's production run. Petrol options followed the small car and Fiesta norm, so there's a choice of 1.3-, 1.4- and 1.6-litre petrol engines with power ranging from 68- through to 100hp. Ford offered a performance ST model too, which came with a 2.0-litre engine producing 150hp. 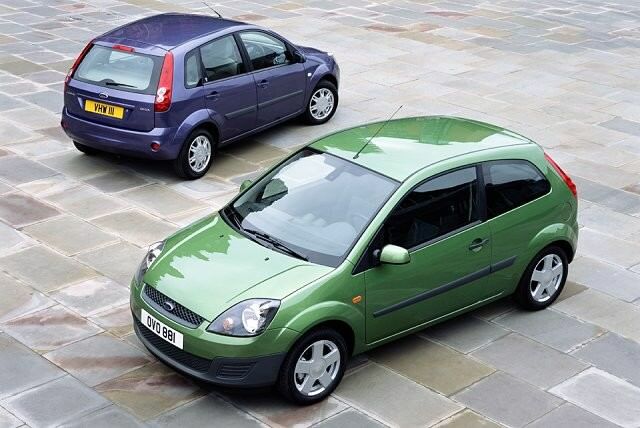 The 1.3-litre petrol was short-lived, replaced in 2003 with Ford's much better 1.25-litre unit, to the benefit of economy. Trim levels follow the usual Ford choices, including Steel, Style, LX, Zetec and Titanium. Add the rare, range-topping ST to that and there's plenty of choice for all. Even entry-level models come with a decent standard level of equipment, the Titanium models coming fully-loaded and Zetec adding some sporting flourishes. All drive well, the interiors are robust, if rather dowdy to look at, and reliability on all is good, too. The major volume in the classifieds is made up of 1.25-litre models so we're not about to argue with that. It's a good engine, with fine economy. As to trim and door numbers that's down to you and your budget, but if you can stretch to a Zetec or Titanium version your small Ford will feel that bit more special. Post-2005 models, which featured facelifted styling, are also preferable as they add some more standard equipment too. The Fiesta is a cracking all-round supermini choice, that's practical, economical and reasonably cost-effective to run. They're common for a reason: they're good. Buy as late and as high specification as you can afford and you'll not be disappointed.